Office Space - Whakatane, Bay of Plenty. 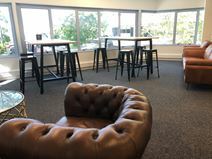 An innovation hub offering co-working and shared office space for innovators, entrepreneurs, consultants, start-ups and small businesses, all looking for a collaborative spaces to build business community in a creative, fun and flexible space. A space that offers hot desks, private offices, and creative spaces as well as meeting and seminar rooms on casual, short and long-term leases. Close to all the amenities you could need in both your work and social life from banks, coffee shops and the post office to the pharmacy, supermarket and even a hair salon. Easily accessible via bus, with a stop less than two minutes walk away.